sew mama sew is one of my favorite sites to visit, they have posted a handmade holidays master list. This list is wonderful for finding ideas for the right person...check it out. 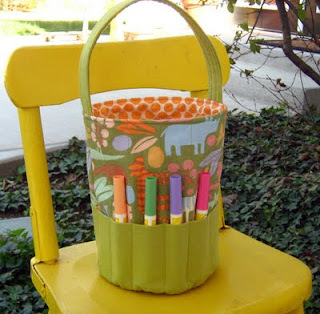 I adapted this Toy Bucket into an Art Bucket by adding a crayon roll type pocket to the front instead of the toy pocket. Following this tutorial it sewed up quickly and the instructions were accurate, I think I will be making some more, and will definitely be tucking this pattern in the quick gift ideas box.